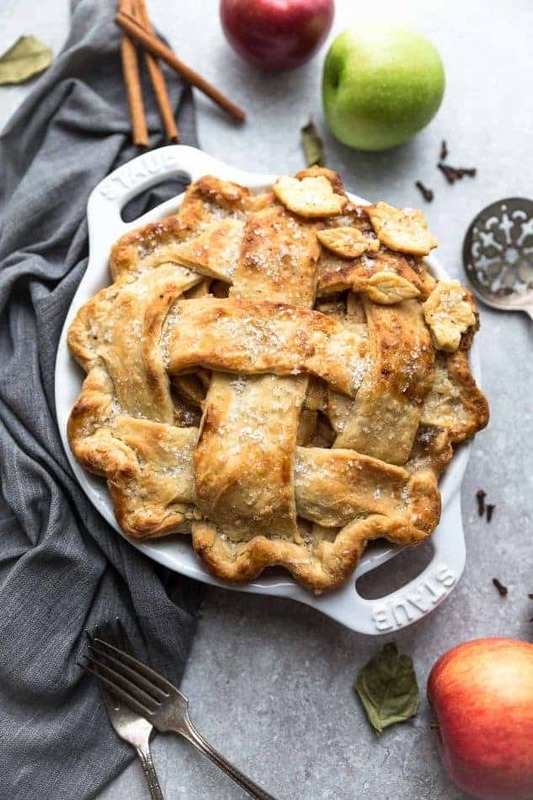 Easy Apple Pie is the perfect classic homemade dessert for fall. Best of all, filled with tender apples, cinnamon, nutmeg, ginger, cloves and baked in a delicious flaky crust! 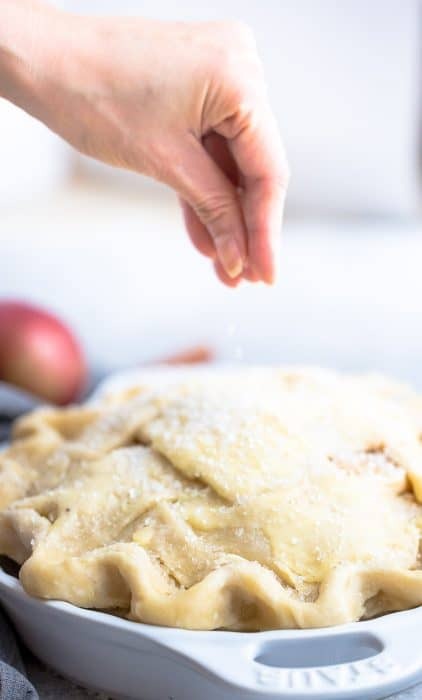 Homemade apple pie is such a classic treat that you can enjoy it all year round. It’s especially perfect during the fall and Christmas holidays when you’re just craving all the comforting dishes and desserts. Pies are one of the seasonal staple desserts that everyone looks forward to after a big holiday feast. This raspberry apple pie and this easy apple pie are my husband and step-dad’s all time favorite dessert. 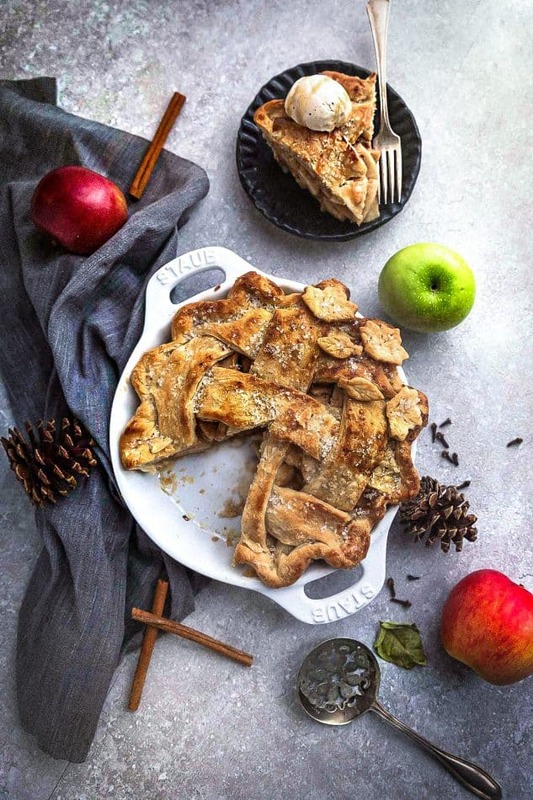 I’ve tried making a ton of varieties throughout the years – classic apple pie, deep-dish apple pie along with many claiming to the best ever and the perfect blue ribbon apple pie. I’m happy to say that after so many tries, this recipe yields our idea of the perfect amount of sweetness, texture and flavor. Perfect with with some vanilla ice cream or coconut whipped cream if you’re trying to keep this dairy free. If you’ve never made a pie before, this would be a great one for first timers! 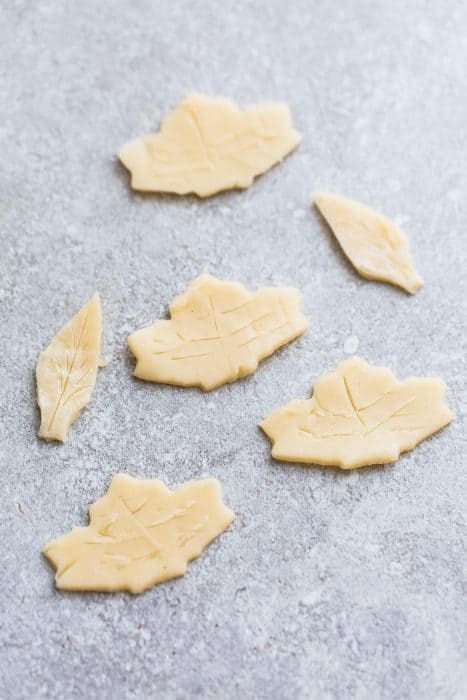 The apple filling is a no-brainer – just peel, cut, and toss with sugar + spices. 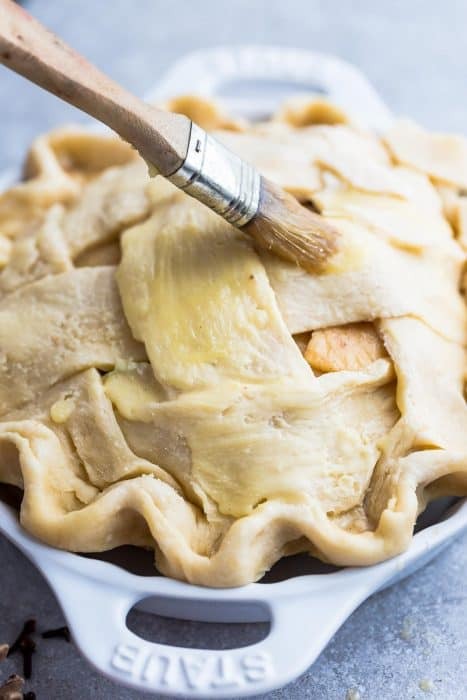 You can use your favorite pie crust recipe or if you’re short on time, feel free to use a premade or refrigerated pie crust. 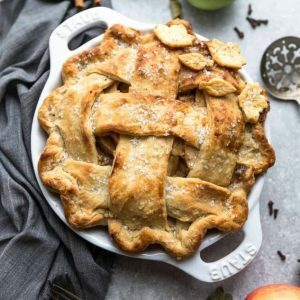 This homemade apple pie makes an impressive dessert for Thanksgiving, Christmas or any time you’re craving apple pie. 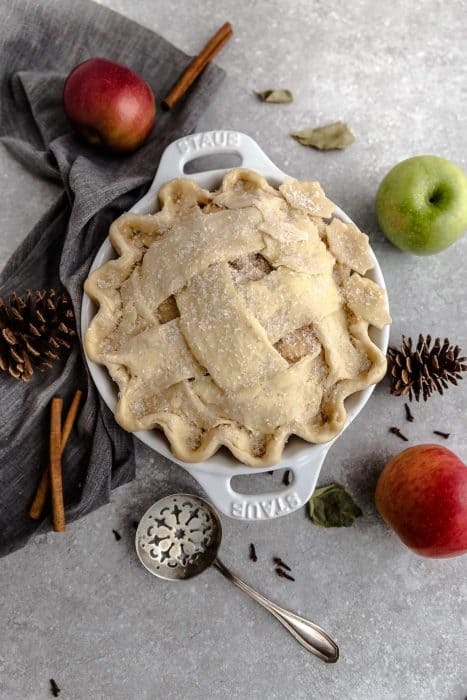 Classic Homemade Apple Pie is the perfect dessert for fall. 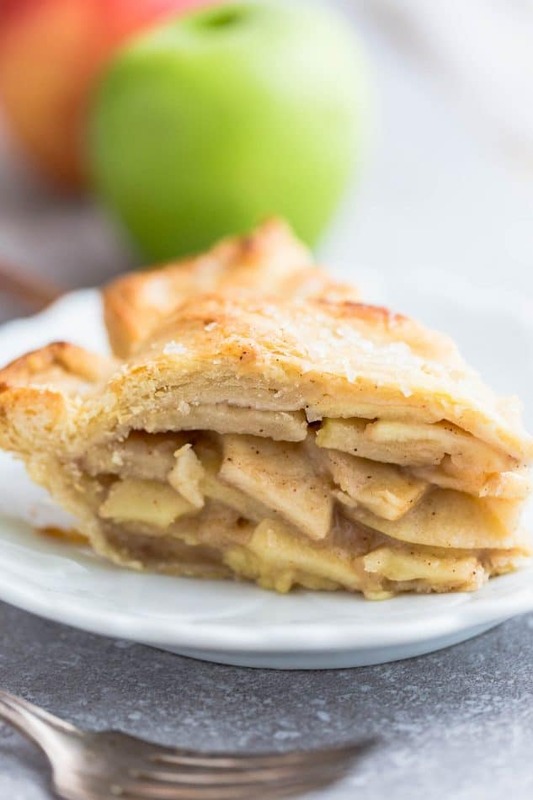 Best of all, filled with tender apples, cinnamon, nutmeg, ginger, cloves and baked in a delicious flaky crust! Combine the granulated sugar, brown sugar, flour, cinnamon, nutmeg, ginger, and cloves together in a medium bowl. Place the apple slices in a large mixing bowl and drizzle with lemon juice. Toss with the dry ingredients and mix to coat. Carefully drape your rolled out pie crust over a standard 9" pie pan - using a rolling pin to help transfer. Leave the edges hanging over and trim any excess pieces. 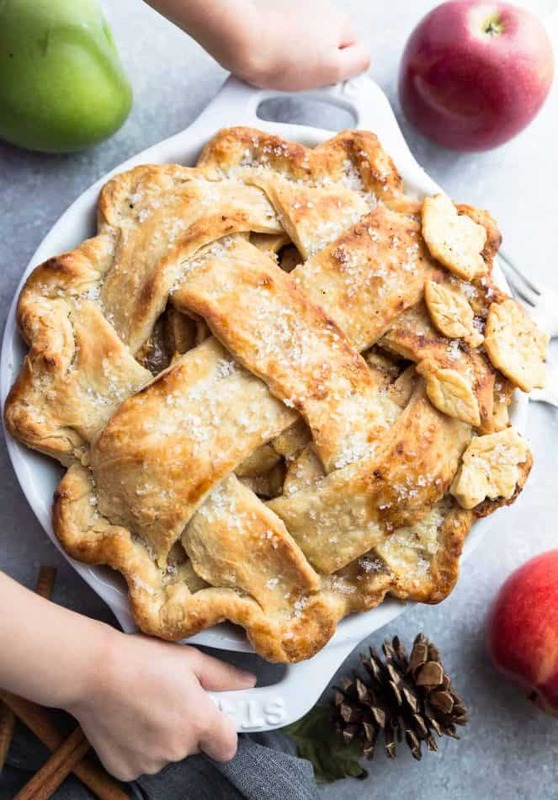 Using a slotted spoon, fill the pie pan with apple mixture, making a pile and packing down tightly. (do not add excess juices from the bowl). Dot with butter and place the second rolled out pie crust on top (you can make a lattice top or simply cut slits to vent the steam). Trim, seal and flute edges. Brush with egg wash and sprinkle with coarse sugar. Cover edges loosely with foil. Place the pie pan on a baking sheet and bake in preheated oven for 15 minutes. Turn oven down to 350 F and remove foil. Bake for an additional 30-40 minutes, or until crust is golden brown and filling is bubbly. If the top of your pie is getting too brown, cover with foil again. Cool on a wire rack.